A friend informed me that Gov. Scott Walker defeated the recall on the same day President Ronald Reagan passed away, June 5th. She added that Walker reminds her of Reagan. As Chairman of The Campaign to Defeat Barack Obama, I have visited several cities in Wisconsin. Chatting with patriots across the state, they sang the praises of Gov. Walker's reforms and his remarkable courage. Despite intense and relentless pressure, Walker stayed true to championing conservative principles. While we all knew that the democrat's attack on the Wisconsin governor had national ramifications, the result of Walker's courage is more powerful than anyone could have imagined. My goodness, this man has inspired a nation. Wow! Gov. Walker stepped up, drew his sword of honor and defeated the multi-headed dragon of liberalism just when our tea party movement desperately needed a hero. Since the beginning of the democrat's absurd recall attack on Walker for simply keeping his campaign promises, Walker and his family have endured horrendous persecution and death threats. Even now, after Walker won the recall, the internet is littered with new death threats on Walker's life. Liberals are tweeting that someone should kill Gov. Walker. Don't you just love the liberal anti-war, let's-be-tolerant-of-everything crowd? Disagree with them and they demand that you be silenced, destroyed or killed. Countless patriots have shared their research which confirms that our government is racing down various wrong roads, all leading to destruction. These patriots feel hopeless, unable to hit the brakes to turn America around. But Scott Walker has shown us that one brave committed man can make a difference. Democrat mayor of San Jose, CA, Chuck Reed is battling the unions to restore his city to fiscal sanity. Mayor Reed said some city employees are making more money in retirement than they did when they were working. His city's system is corrupt and insane. San Diego, CA, mayor Jerry Sanders is fighting to implement reforms which he says will save several billions over the next ten years. On average from 60% to the upper seventies, voters are supporting this new wave of courageous mayors and governors in their quest for fiscal morality and sanity. Now that Scott Walker has led the way, I predict a tsunami of mayors and governors suddenly finding a backbone to say no to workers receiving immoral unsustainable benefits. 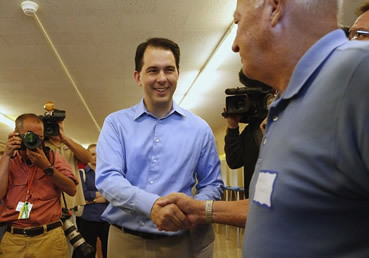 Ann Coulter called Walker's victory, “The recall heard around the world.” That is pretty powerful – one man! I do not know about you, but I feel empowered – what I do does matter. Your book matters. Your video matters. Your song matters. Your running for office matters. Brothers and sisters, imagine the power of an army of Scott Walkers – all fully committed to restoring the God inspired conservative principles which have made us a great and prosperous unique experiment – America. My name is Lloyd Marcus and I am Scott Walker! As Chairman of The Campaign to Defeat Barack Obama, I have visited several cities in Wisconsin. Chatting with patriots across the state, they sang the praises of Gov. Walker's reforms and his remarkable courage.